Mist technology was chosen by Chris Enness who saw the potential of misting technology used in sprinklers to be used by fire fighters at incidents. 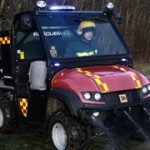 From fire testing through to delivery of our Rapid Response Utility Vehicle with WaterMist technology. 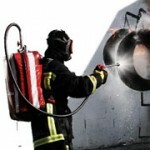 Working alongside current personal protection equipment within fire brigades our bespoke system has been selected for multipurpose extinguishing. Continuous modernisation and development has lead to a new SIU design, essential fire fighting and rescue equipment at the ready, and BacPac is in there.